Calling all budding art students. 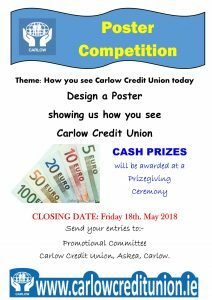 Design a poster that shows us how you see Carlow Credit Union today. We will have a prizegiving ceremony where Cash Prizes will be presented. Promotional Committee, Carlow Credit Union, Askea, Carlow.